“Different Drummers Drum Circle” of Yarmouth, Maine has recently moved to Santa Fe. It’s founder and host, Rick Cormier, author of the book, “Freestyle Community Drum Circles“, moved to Eldorado in September. He quickly found a location for his drum circle in town and now has agreed to host another monthly drum circle at The Performance Space in La Tienda every 3rd Wednesday of the month at 7PM beginning February 19. Participation is free. No experience is necessary. All skill levels are encouraged to join in. Dancers are welcome also. Loaner drums will be available. “Freestyle” means that our rhythms will be both improvised and accessible to all, as opposed to traditional or memorized. 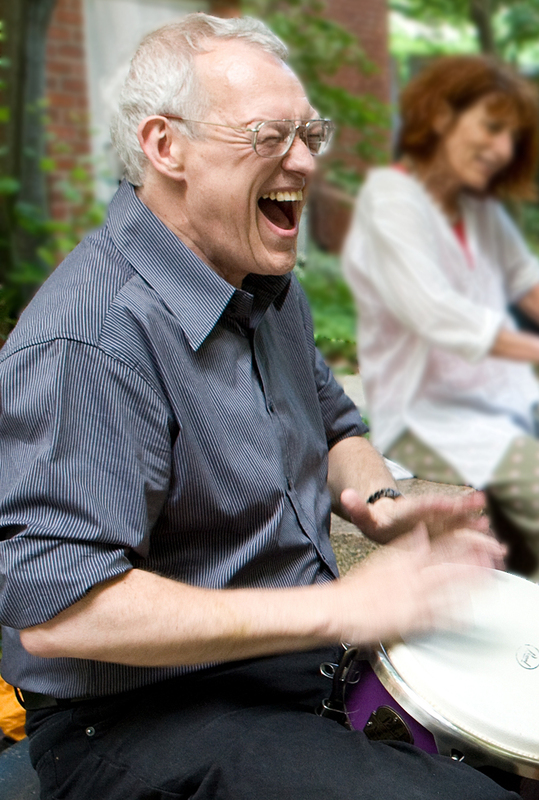 Rick first became involved with community drum circles in Massachusetts during the 1990’s. His “Different Drummers Drum Circle” of Yarmouth, Maine, hosted more than 2000 participants from more than 25 countries. After ten years, over 600 Mainers considered themselves members of DDDC. Rick has helped in the start up of dozens of freestyle drum circles in the U.S. and Canada and has drawn many thousands of people, from children under age 5 to seniors over 90, into the world of community drumming. It is no wonder he has been called, “The Johnny Appleseed of drumming”! Describing Rick when he ‘cuts loose’ on a handdrum, one reporter wrote, “He represents the pure joy that music can invoke.” In Maine, he taught group drumming at a Waldorf high school, drummed in a blues band and was the director of a popular musical ensemble that recreated the best of Different Drummers on stage. When he’s not drumming, Rick is a licensed psychotherapist specializing in anxiety disorders and trauma. This entry was posted in Uncategorized and tagged Different Drummers, Drum Circle, eldorado, Rick Cormier, The Performance Space. Bookmark the permalink.